Today’s consumers are extremely demanding and nowhere is their patience shorter than when dealing with your call center. If you leave callers on hold, your agents will hear the complaints (which extends handle times) and your social media timeline will show angry tweets. (Have you looked up your company on OnHoldWith.com? You might be in for an unpleasant surprise.) So having hold times of more than a few minutes is just asking for trouble. What can a call center manager do? Sure, more agents will reduce wait time, but agents are expensive! Luckily, in this case, there is another answer: Replace hold time with a call-back. If you’re considering a call-back solution for your call center, here are some things you should check off your list before proceeding. 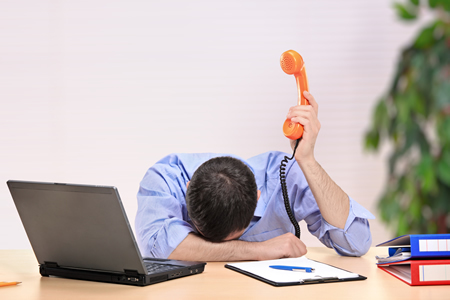 Surveys regarding customer service complaints consistently show that “waiting on hold” is at the top of the list. Obviously, eliminating something the causes dissatisfaction, will lead to increased satisfaction. However you measure client happiness – NPS, repeat visits, repeat purchases – you are certain to see improvement. If your call center has “spikey” call volume, you’re faced with an extra challenge: If you staff to the peak volume, you will have excess agent capacity at other times. Call-backs also help “smooth-out” spikes in call volume by deferring calls (in a customer-friendly manner) till a time when there is excess agent capacity. Part of any call-back system is playing the offer message. This is usually something like, “Instead of waiting on hold, you can get a call-back from the next available agent by pressing 1 now.” The “Time-Till-Offer” or “TTO” is the amount of time a caller spends in queue before hearing a call-back offer. Many companies don’t realize how critical the timing of this message is. Although this sounds complicated, it’s actually good news. 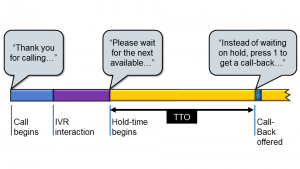 Changing TTO is an easy “lever” to adjust and has a big impact on the performance of your call-back deployment. I definitely advise you to put effort into getting this timing right! 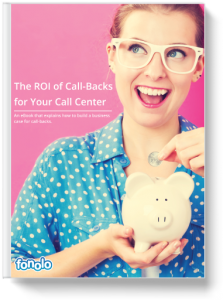 For more on this topic download our eBook, “The ROI of Call-Backs for Your Call Center”. After the queuing is complete, a call-back system has to somehow connect an agent with a caller. Familiarize yourself with the two main ways of doing this: “agent-wait” or “customer-wait”. In the customer-wait scenario, the call-back system tries to estimate when the next agent is going to be ready, and calls the customer a few minutes ahead of that time. This maximizes agent efficiency, but it results in a negative experience for the customer. From their perspective, they requested a call-back only to be placed on hold again. If the system incorrectly determines agent availability, then hold time can be long, negating the advantage of having call-backs in the first place! The alternative is the agent-wait scenario. Here, the agent is already on the line when the customer answers the call. This is a better experience for the customer, but the agent has to wait while the customer’s phone rings. Luckily, the idle time is typically 10 seconds or less. Sometimes “agent-wait” and “customer-wait” are called “agent-first” and “customer-first”. To avoid confusion just ask your call-back vendor to walk you through the timeline, so that this isn’t one of those things “you wish you knew”! The vast majority of contact centers are using multiple channels to interact with their customers. Each channel has its strengths, but the voice channel really stands apart. That’s because, when you have a tough issue to discuss, when there is an urgent matter, or when the other options have left you frustrated, there’s an instinctive desire to talk to another human. This isn’t a criticism of self-service channels, since they are cost effective and most customers prefer them now anyway. But, remember that even the best self-service systems can’t cover every possible path. There will be dead-end moments, where the customer needs to talk to an agent. This is one reason call-backs are so important: they allow your callers to escalate smoothly to a voice conversation from any other channel. So make sure your call-back solution has strong multi-channel capabilities, like pre-built components that can be added quickly to your web page or mobile app. And make sure that all the relevant teams in customer service are aware of your new call-back functionality. Until recently, adding call-backs to your call center required installing hardware or software offered by the vendor of the call-center system. For example, Avaya sells CallBack Assist for its platform and Cisco sells Courtesy Callback for its platform. 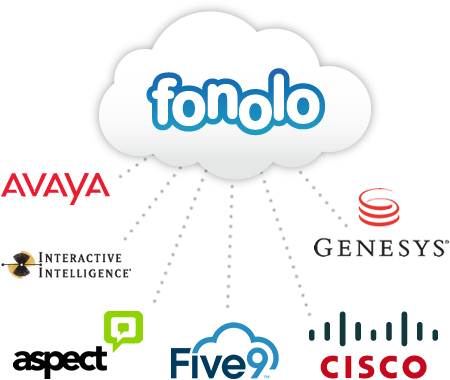 Fonolo changed all this by introducing a new way to add functionality to an existing call center: A cloud-based platform-agnostic approach that is easy to deploy on any call-center. The secret to being platform-agnostic is that the interaction between the call-back solution and the call-center is accomplished purely with phone calls. Because all centers can accept phone calls (by definition!) this makes the Fonolo solution universally compatible. We make it simple to use, but a lot of work “under the hood” is required to make that possible. Some of that work is spelled out in our many patents on the topic. For more details on picking a solution, see “Make Callbacks a Priority”. That post includes 6 key questions that you should ask your vendor before deciding. Call-backs are one of those rare win-win situations in the call center world: Callers have a more pleasant experience and the call center gets a more efficient operation. If you’re exploring this option today, we are happy to help any time. Sign up for a live demonstration to learn more about how call-backs work. You make a really good point about not making your customers wait twice! In a perfect world, customers would never have to wait. Unfortunately, that's not always avoidable, so the next best thing is to make the wait seem shorter and more bearable. 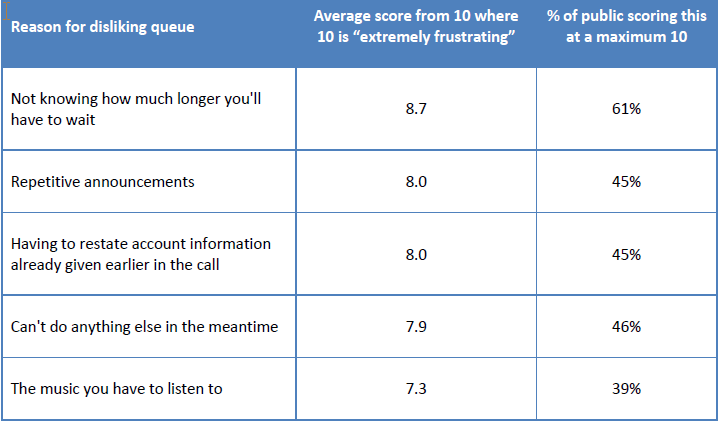 I've uncovered a list of factors that influence wait time perceptions. One is boredom, or idle time, which is what happens when a customer waits on hold. Any sort of repetition, such as making the customer hold a 2nd time or even just subjecting your customer to a looping hold message makes it even worse. Thanks for your comment, Jeff. And for linking to "Jedi Mind Tricks" post. I'm a big Star Wars fan. We have just deployed the Avaya callback option for our contact centre, what we are not sure of is if the callback option will count as an abandoned call or will it be taken as an answered call. Naturally we would like this to count as an answered call. It's best if you email us at info@fonolo.com so we can discuss the particulars of this. What about keeping a vendor accountable? Yes the customer benefits from this, but if you have a 3rd party vendor taking the calls, they would get an artificial service level boost from this system. Is there a way or calculation method that you could use to still account for these call backs in the service levels? Jeff, thanks for the comment! Yes, companies can definitely include call-backs in their service level calculation. Alex, thanks for your comment. It's better for call-backs to be blended in with the all the regular call traffic and routed to agents in the same way. Regarding your comment "Not be fully aware of what happened"... Keep in mind that, whether the connection between caller and agent is made via call-and-wait-on-hold or request-a-call-back, it doesn't change the need for call centers to have a system for agents to know about previous history with the caller.